Yankee third-baseman Alex Rodriguez makes more money than the entire Houston Astros baseball club. That’s a little hard to believe but it’s true. Now Major League Baseball is hot on his trail and the result could determine if ARod will ever take the field again for New York or any other MLB club. New York Times reporter Michael S. Schmidt co-authored the original NY Times exposé involving Rodriguez and other big named MLB players with the dubious clinic in Miami named Biogenesis where the league and the Times claim that the athletes were regularly given PED’s or Performance Enhancing Drugs which are banned by MLB. The league has already placed minor league player Cesar Carrillo on a 100 game suspension and is applying major league pressure on him to cooperate with their investigation of Biogenesis. Carrillo’s name was found in the clinics documents and he later lied about knowing Anthony Bosch, the now infamous head of Biogenesis. All that was bad enough but, now it gets worse. Schmidt and the New York times recently released a story which reports that Yankees third-baseman Alex Rodriguez had previously arranged to purchase documents from Biogenesis presumably for the purpose of destroying them before they could be made public. MLB has made several efforts to obtain that same paperwork implicating Rodriguez and others with the clinic. So, in the end, Selig’s office paid a former Biogenesis employee for access to the records and reportedly uncovered what they believe is enough evidence that a representative of Alex Rodriguez purchased medical records from a person connected with the Biogenesis anti-aging clinic. According to the Times stories, there are several other MLB players involved with the controversial clinic. If it turns out the Selig’s office can prove these allegations if will be bad news for ARod who will be charged with interfering with a MLB investigation. At present Rodriguez is recovering from a serious hip surgery and is on the 60-day disabled list for the Yankees. ARod told Yankees manager Joe Girardi that he is now able to run slowly on a treadmill. 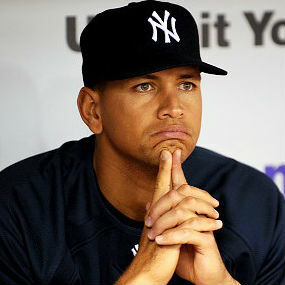 However, even if the hip heals perfectly, some doubt that Alex Rodriguez will ever play professional baseball again.